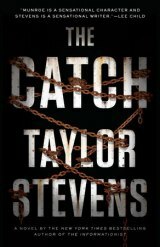 Editor's Note: Taylor Stevens's 'The Catch", published last year in hardcover by Crown Publishers, will be published June 9, 2015 in a quality paperback edition by Broadway Books. Savvy areaders know that -- even before they open a novel by Taylor Stevens -- you'll find her androgynous heroine Vanessa Michael Munroe in the thick of action in some of the world's most dangerous places. That designation describes Djibouti, capital of the eponymous small (about 9,000 square miles with 810,000 people) nation fronting the Gulf of Aden, and the seaport city of Mombasa, Kenya, two of the settings of "The Catch" (Broadway Books, 384 pages, $14.00). The novel opens in Djibouti, where Munroe, in her male guise, is working as a fixer and interpreter for a small maritime security company headed by Leo, with his wife Amber Marie and soldier of fortune security guard Natan rounding the list of employees. Leo wants Munroe to accompany him aboard the old freighter Favorita to Mombasa, to protect the ship and the cargo -- bags of rice headed for South Sudan by way of Kenya. At first Munroe is reluctant, wondering why Natan doesn't go along on the voyage. Leo convinces her that her knowledge of the region and especially her knowledge of the languages, Somali and Swahili, will help him on his apparently humanitarian mission. Leo is also appreciative of Munroe's fighting skills, especially with knives. Not long into the voyage through the pirate-infested Indian Ocean, Munroe discovers that the bags of rice are merely window dressing for a cargo arms and ammunition, part of a gunrunning operation of which she wants no part. But it's too late, and when a team of pirates attack the ship, Munroe manages to escape with the unconscious captain on an inflatable boat to the Kenyan coastline. I won't go into all the details of Munroe's actions in Kenya. Suffice it to say that the Slavic captain was the main target of the attack. She uses all her skills to help Amber and Natan plan a mission to get the ship back. Anyone who underestimates Munroe does so at his or her peril. Taylor Stevens continues her saga of Vanessa Michael Munroe, begun in "The Informationist" (see my review: http://www.huntingtonnews.net/11908) with a fast-paced action thriller that vividly shows why Munroe is probably the best new action hero. The Canadian film-maker has optioned the rights to Taylor Stevens's bestselling novel, which centres on the information specialist Vanessa Munroe. The story sees the character, described by producer Jon Landau as a "mix of Lisbeth Salander and Jason Bourne", finding herself back in the Africa of her childhood after being hired by a Texan oil billionaire to find his missing daughter. "Vanessa Munroe is an intriguing and compelling heroine with an agile mind and a thirst for adventure," said Cameron. "Equally fascinating for me is her emotional life and her unexpected love story. I'm looking forward to bringing Vanessa and her world to the big screen." Landau added: "This is one of the most cinematic books I've ever read. And it's got all the classic Jim Cameron elements – a female protagonist who is smart, physically adept and skilled, great action, and an unexpected love story." Summing up, if you fell in love with Munroe in "The Informationist" and the subsequent novels "The Innocent" and "The Doll", you'll love "The Catch." Taylor Stevens is the award-winning and New York Times bestselling author of "The Informationist", "The Innocent" and "The Doll". Featuring Vanessa Michael Munroe, the series has received critical acclaim and the books are published in twenty languages. "The Informationist" has been optioned for film by James Cameron's production company, Lightstorm Entertainment. Born in New York State, and into the Children of God, an apocalyptic religious cult spun from the Jesus Movement of the '60s, Stevens was raised in communes across the globe. Separated from her family at age twelve and denied an education beyond sixth grade, she lived on three continents and in a dozen countries before reaching fourteen. In place of schooling, the majority of her adolescence was spent begging on city streets at the behest of cult leaders, or as a worker bee child, caring for the many younger commune children, washing laundry and cooking meals for hundreds at a time. In her twenties, Stevens broke free in order to follow hope and a vague idea of what possibilities lay beyond. She now lives in Texas, and is at work on the next Munroe novel.